Michael Sanzone collects these little pieces of art and turns them into art of his own. Though a bit of a square, the postage stamp is our kind of companion: well-travelled, tells a good story, and easy on the eyes. Michael Sanzone recognizes this, too, which is why he collects these little pieces of art and turns them into art of his own. Playing with color and composition, he places unused vintage sets that he's collected from various sources—his travels, friends, online auctions—in patterns to create a cohesive, colorful work that connects past, present, and future. 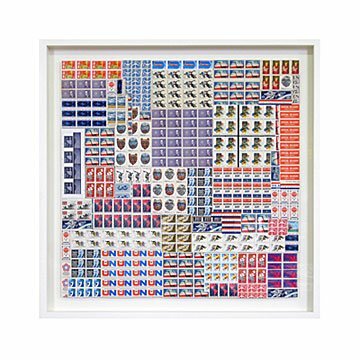 For this piece, Michael uses all United States stamps, including a collection called "Atoms for Peace," inspired by a 1955 speech by President Eisenhower about using atomic power for good, not warfare. "This piece is ultimately about aesthetics, travel, history, and the postal system itself." Handmade in Brandford, Connecticut. Michael Sanzone believes in reincarnation— at least when it comes to objects. The New York and Connecticut-based artist collects everything from whiskey barrels to postage stamps and turns them into works of art. This process, he says, links experiences to the materials found there, giving them new meaning and connecting the past, present, and future. Michael’s work has been displayed in such spaces as a distillery, an iconic department store, a cruise ship, and, good old fashioned galleries.